Bagmati (Nepali: बागमती अञ्चल Listen (help·info) Bāgmatī Añcal) was one of the fourteen zones of Nepal until the restoration of zones to Provinces. It was named after the Bagmati River. 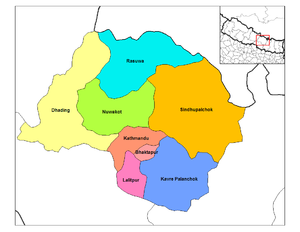 It was in the Central Development Region of Nepal. The districts are now all part of Province No. 3. The zone contains the Kathmandu Valley with its conurbation of 4.5 million inhabitants. This page was last edited on 4 November 2018, at 16:11 (UTC).